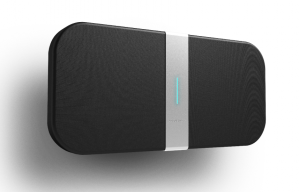 The Acouspade™ is a hyper-directional speaker, emitting a highly directional beam of sound. It is able to place a particular sound at a desired spatial location, while preserving silence where the sound is not needed. 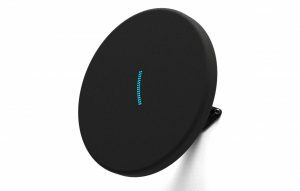 The Acouspade directional sound system also allows the co-existence of different sounds in a relatively small spatial area without mixing or interfering. The laser-like directionality of sound is achieved by exploiting the parametric array effect. The Acouspade directional speakers creates an audio spotlight phenomenon, which can turn selected objects into virtual sound sources, reflecting the primary beam of sound. 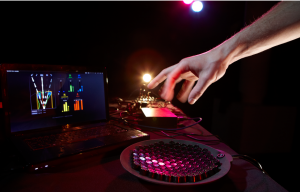 Syntact™ is a new musical interface based on the revolutionary technology of contact-free tactile feedback. A curved array of ultrasonic transducers is focusing acoustic energy into one spatial point, creating a tangible vibration in midair. Syntact™ enables musicians to virtually mold and shape the sound with their hands. The technology behind Syntact can further be used for creating futuristic Human-Computer interfaces, which can add a tactile experience to holograms. The new Acouspade Classic was re-launched in 2017, reviving the circular shape of the classic design form our first directional speakers, launched in 2011. Unlike the original Classic directional speakers, which had an external amplifier, the new Acouspade Classic integrates a miniaturized amplifier within the emitter housing. The new Acouspade Classic uses a Class-D amplifier and a fully digital signal processing system. Like the new Acouspade, it can deliver a narrow beam of sound to a desired area, where the sound is needed, while preserving silence around it.